A bright light appeared in Russell's sacred (secret?) grove. Because I am evil I got a cheap laugh out of that. My friend Dr. Zodiak helped me seer that the moon rocks are better seer stones. I'm seering things all the time now! but I see you already used that one for Oaks. > Sensimilla Signs and Tokings. Haha you know god smokes herb, he made the herb. He who walks among the rows. He who walks among the crows. A murder of them. The Lord has revealed to me that now is the time to change the sacrament food to Mt. Dew and Doritos. I vote brownies instead of bread and herb tea instead of water. My my how times have changed. There was a time here on RfM when the slightest whiff of merry wanna would rate a most severe moderator stink eye. "Meet my third wife, Mary Jane." 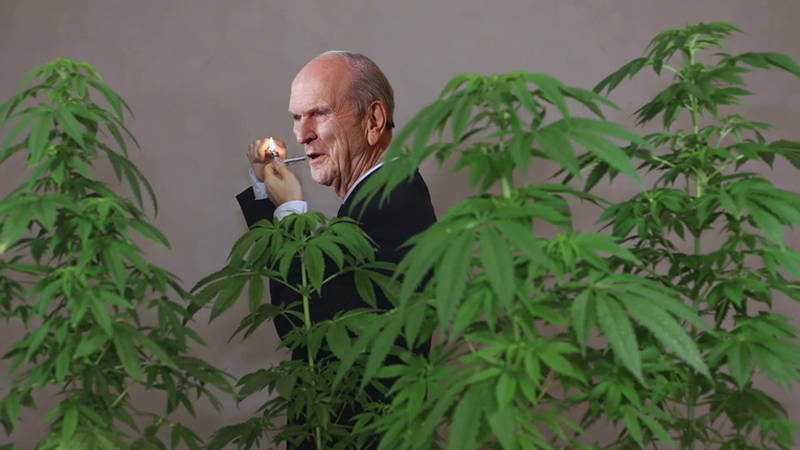 "I wonder if this can be put into my General Conference donuts." "I'm so glad this stuff survived the actual, literal worldwide flood 4200 years ago. Noah was a genius to bring it on the ark." "Hey, Dallin. Like, what would happen if Heavenly Father and Jesus had an arm-wrestling match? Oh dude, that would be awesome!" will be better than carrots chopped up and stuffed into green jello! "Russell, see that thou art naked. Therefore, fashion an apron from these leaves to hide your nakedness." LOL! Don't smoke the sacred leaves if you can smoke the bud. Last night ... God revealed to me: "It's heart healthy." Roy G Biv Wrote: ------------------------------------------------------- > The Lord has revealed to me that now is the time > to change the sacrament food to Mt. Dew and > Doritos.